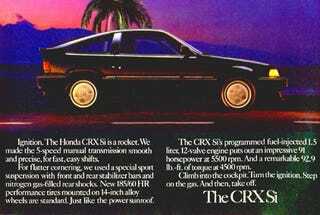 The Milo Minderbinders over at Winderbinder Road report that a new CRX is under serious consideration in the hallowed halls of Honda. Many of Los Jalops have gone on record expressing their love for the wee two-seater, which was unceremoniously dumped like sympathy prom date in favor of the resolutely feminine Del Sol. But with the success of the Mini and other conveyances of its ilk, the powerful dreamers think the time might just be right for a Fit-based revision of the classic mighty mite.